Microsoft Virtual PC 2007 is a free virtual machine virtualization software from Microsoft that includes native support for Windows Vista operating system as host and guest operating system. If a user lack of extra computer, the user can download and install Virtual PC 2007 (VPC2007) on their existing system (host OS) in order to to install another guest operating system such as Windows Vista on the same machine. If you indeed interested in trying out Windows Vista in a virtual computer without additional hardware, but only has Windows Vista ISO DVD image downloaded, and do not want to burn or write the ISO image to a DVD, it’s possible to install Windows Vista directly with the ISO image with Virtual PC 2007. Download VPC 2007 and install it. 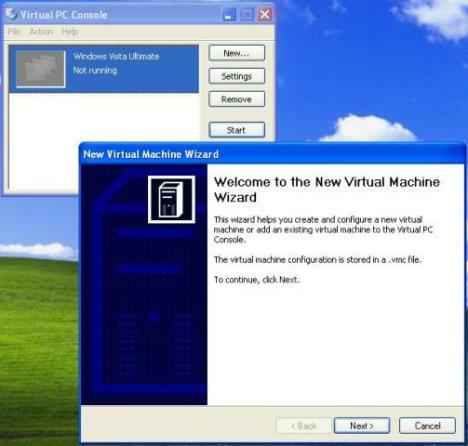 Run Microsoft Virtual PC and click on “New” button to start the New Virtual Machine Wizard. The in the “New Virtual Machine Wizard”, select “Create a virtual machine radio” button, click “Next”, then specify where you want to store the virtual machine file (you can use Browse to select), click “Next”, and then select “Windows Vista” as the operating system that you plan to install on this VM. In the rest of the process, you can set or adjust the size of memory to allocate to the VM, specify virtual hard disk location or create a new one, and set the size of the virtual hard disk size (all options can be kept as default or recommended values). After finishing configuring your virtual PC, click Finish. In the Virtual PC Console, select the virtual machine that has just been created, and click Start. Now, if you have a Windows Vista DVD, insert it into DVD drive now and press Enter. Else, skip to next step. You should have download an Vista DVD image (only ISO format is accepted), then click on “CD” menu on the virtual machine window, and then choose “Capture ISO image”. Select the Windows Vista ISO image file by using Browse button. Click OK when done. Windows Vista setup will be launched, follow on-screen instructions to complete the installation of Windows Vista. If your network doesn’t have DHCP service or for whatever reason the virtual machine boot process hang, complete the step to capture ISO image (select the Windows Vista ISO), then simply reset the virtual machine. Upon next boot up the ISO image will be loaded automatically. Microsoft Virtual PC can be installed and ran not only on 32-bit and 64-bit and all editions of Windows Vista, it can also run on Windows XP and Windows Server 2003, so users can use VPC 2007 to put Windows Vista on test. If you plan to permanently use Windows Vista on the virtual machine, a valid and genuine license is required, although VPC 2007 itself is free.